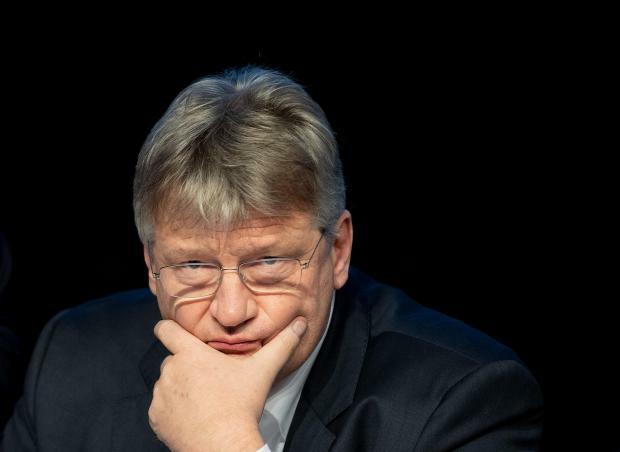 Co-leader of the Alternative for Germany (AfD) far-right party Joerg Meuthen attends his party's meeting. Members of the AfD meet to decide whether to champion Germany's exit from the EU in their campaign for the upcoming European parliamentary elections, at a time when Brexit is already roiling the bloc. As the British parliament prepares for a crucial Brexit vote Tuesday, Germany's far right voted Sunday to break a national taboo by campaigning to quit the European Union if its demand for reforms within the bloc are not met. A party congress gathered in Riesa in Saxony state -- the Alternative for Germany's (AfD) biggest stronghold -- voted for the demand to be included in its manifesto for European Parliament elections in May. Aware that a vast majority of Germans remain in favour of their country's EU membership, delegates advanced cautiously. They called for a so-called "Dexit" only "as a last resort" if fundamental reforms do not reshape the EU "in an appropriate timeframe". But the decision marks the first time in Germany's post-war history that a political party has dared suggest blowing up the nation's EU membership. Alongside the transatlantic alliance with the United States, membership in the EU project has long been a key element of German national identity, and one way the country has sought to move on from the Nazi past while defending its interests. By contrast, "AfD is trying to rehabilitate a German nationalist position" in political debate, historian and political scientist Klaus-Peter Sick told AFP. "This position is a normalisation of the nationalist right relative to what's going on in neighbouring countries like Italy or France," he added. "By moving onto this territory, AfD is carrying out a test within the party and among voters to discover whether it's a theme that can glean support." Germany's biggest opposition party since September 2017 elections, the AfD produced its manifesto only after intense internal negotiations. If "deep reforms" are not made, "we judge it necessary, as a last resort, for Germany to leave the EU or for the EU to be dissolved" in favour of an economic community, it declares. Among the changes demanded by the party are the abolition of the European Parliament and the euro single currency as well as an end to the "Islamisation" of Europe. Many delegates originally hoped for an even tougher programme on "Dexit" that would allow just one European Parliament term -- until 2024 -- for reforms before the AfD would campaign directly for departure. But party chiefs urged the congress not to tie its hands with a fixed date. "I think we would be badly advised to campaign with a maximalist demand," said joint leader Alexander Gauland. He warned that if Brexit causes significant upsets to the British economy, comparable demands from a German party could scare off voters. More generally, with a massive pro-EU majority in Germany, AfD bosses know they could deter swathes of potential voters by talking too loudly about quitting. A European Parliament survey in November found 82 percent of Germans would vote to remain in the EU if the country held a UK-style referendum, while 75 percent saw Brexit as either "probably" or "definitely" the wrong decision. The move opens up a new front for the AfD alongside opposition to Islam and immigration, the foundation of the party's electoral successes since 2015 and the arrival of more than one million asylum seekers. Far-right leaders need fresh issues to whip up sentiment, after their favourite punching-bag Chancellor Angela Merkel announced her retirement for 2021 at the latest. Their European sally comes two days before a critical UK parliament vote on whether to accept a deal that London has negotiated with Brussels. At present the accord looks set for rejection, increasing the danger of a chaotic departure with unforeseeable consequences.